Francesca Noyes has dedicated her career to practicing immigration law. Prior to joining Dayzad Law Offices in 2017, Ms. Noyes worked at an immigration law firm in Chicago, where she represented clients before the United States Citizenship and Immigration Services, as well as in immigration courts. Ms. Noyes received her law degree from DePaul University College of Law in Chicago. During law school she focused on immigration and public interest law, earning a certificate in Public Interest Law. She participated in various internship programs, which included working at the Department of Justice, Executive Office for Immigration Review in Chicago and multiple non-profits. She also participated in her law school’s Asylum & Immigration Law Clinic, representing victims of serious crimes. Ms. Noyes was admitted to the Illinois Bar in 2014 and the California Bar in 2015. 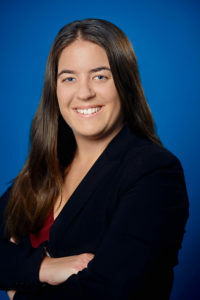 Ms. Noyes received her Bachelor of Arts degree in Peace and Conflict Studies with a minor in Education from the University of California, Berkeley, which is where she first became interested in the complexities of immigration law. With her own family emigrating to the U.S. and growing up in the diverse, immigrant-rich city of Los Angeles, Ms. Noyes has developed a passion for working with the immigrant community. Outside of work she enjoys traveling, cooking, and spending time with family and friends.